Bakshi of MDI says, "Warren Buffett demolished the distinction between growth and value long ago when he said growth was just a component of value, sometimes negative and sometimes positive. Averaged out, growth in the airline industry has hurt investors while growth in the chocolate business has made investors rich." Raamdeo Agrawal, joint managing director, Motilal Oswal, says value investing is what every investor practices. This is because the aim of investing is making money and to do that one has to buy at a price less than what it is expected to be. "Investing is broadly classified as value and growth but I don't believe they are separate. No one will buy a business if it is not growing," he says. Vinay Khattar, research head, Edelweiss, says, "We focus on stocks that are out of favour with the market or are valued below their intrinsic worth as earnings growth expectations are muted. In this context, even a small change in earnings growth expectations can give fairly good returns, even as the downside is protected." "We also believe that a margin of safety exists in stocks trading at fair value but where the visibility of future earnings is high given the huge opportunity size in the business," he says. One can also create own rules. "I look at assets generating acceptable returns. Acceptable economic growth rate is the opportunity cost to the shareholder for investing in the equity of that company," says Phani Sekhar, fund manager, portfolio management service, Angel Broking. ICICI Prudential's Naren says despite the perception that India is a growth market, value investing has a good chance of working here. 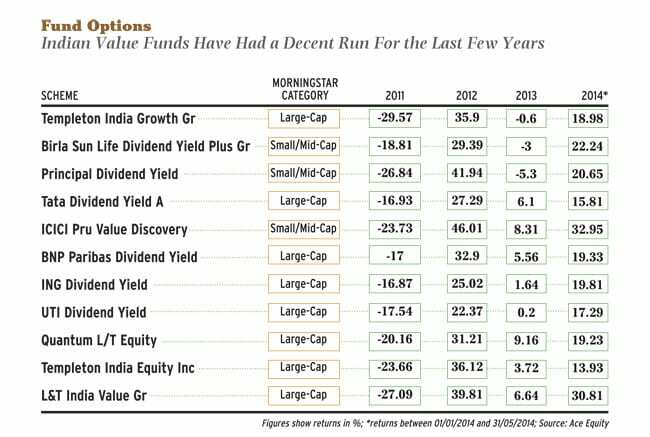 "Our experience with value investing over the last decade has been good. We believe that value investing requires an investment horizon of three-five years to bear fruit," he says. But Parag Parikh of PPFAS says not all forms of value investing will work in India. "In India we do not have corporate raiders and hostile takeovers. Further, in Indian companies, usually the promoter family controls a large part of equity, and so it is difficult to impose change or protect minority shareholders." That's why Parikh says that one must be on guard against value traps. 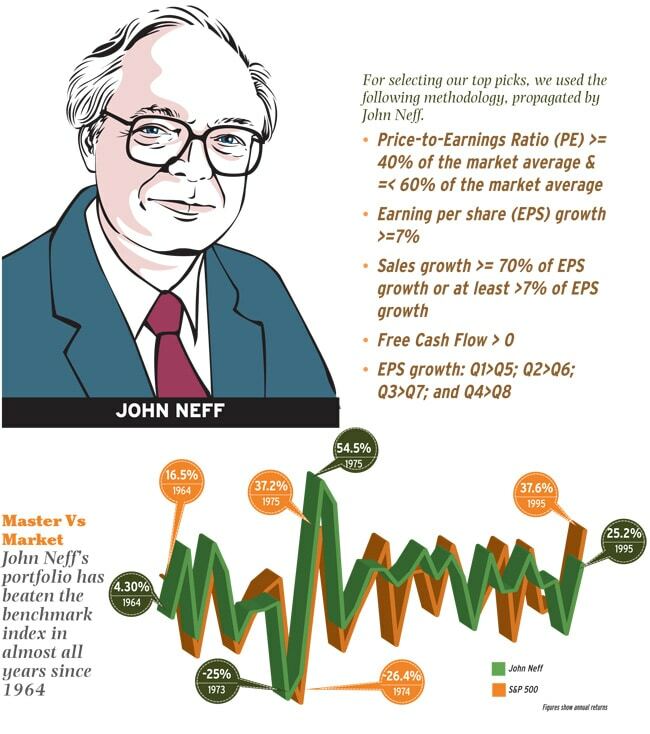 Based on his book 'John Neff on Investing' and various commentaries on his methodology, we at MONEY TODAY created criteria to select stocks in the current Indian market. Just 10 stocks out of hundreds of those screened managed to pass the stringent tests prescribed by Neff. Over the years, TCS has been adding a lot of new services to its offerings. It has guided for higher growth in 2014-15. This is despite a very high base and strong growth in 2013-14. Dipen Shah, head, private client group research, Kotak Securities, says, "We expect revenue to grow at 13% a year (in rupee terms) and net profit at 12% a year over the next two years." Experts say an efficient sales mechanism and effective delivery are the two differentiators for TCS. The company also has had a stable management team, which has ensured continuity in strategy and performance. "A lot will depend upon the movement of the rupee. A sharp rise over the next two years may limit gains for the sector. If the rupee remains around the current levels, the stock may give an annualised return of 10-12% over the next 24 months. However, in the short term, it may move within a range after its recent rise," says Shah of Kotak. The global auto ancillary company has been a remarkable value creator for shareholders. The stock has returned 40% a year since the initial public offer in 1993. The cumulative rise during this period has been 1,000%. Vishal Jajoo, senior research analyst, Private Client Group, Nirmal Bang Securities, says, "The stock has already given multi-fold returns. The trend is expected to continue. We expect the rise in earnings to get reflected in the share price. We have a target of Rs 580 for the stock over the next 24 months." The company earns 85% consolidated revenue from India and Europe. However, these two geographies account for just 25% of the 75 million global car market. The management's recent comments indicate plans to focus on the US and China, which means the company's target market will treble to 75% of the global car market. The return on capital employed, or RoCE, in 2013-14 is estimated to be 28%, a rise of 1,400 basis points year-onyear. This was aided by sharp improvement in core operating margins at the key subsidiaries, SMP & SMR, and higher asset sweating. The management has guided for 40% RoCE. Jajoo of Nirmal Bang says the company is on track to achieve the target. RoCE measures how well the company is using its capital. The stock has risen 116% in the four years till July 1. This is all the more striking if we compare it with the rather mediocre performance of banks. The BSE Bankex rose 65% to 17,558 during the period. VK Vijayakumar, investment strategist, Geojit BNP Paribas Financial Services, says, "The reasons for the rise are consistent industry beating performance and earnings quality." The bank's strengths are its ability to grow even in difficult times and the quality of earnings, reflected in the lowest non-performing assets, or NPAs, in the industry. The bank has been registering healthy profit growth. It booked net profits of Rs 5,167 crore, 6,726 crore and Rs 8,478 crore in the three financial years from 2011-12. "One can expect profit growth of 26-30% a year over the next three years," says Vijayakumar. For investors, a major negative is that the stock is expensive (PE ratio of 23 and priceto-book value of 4.6). On July 3, the industry PE was 17.58. However, Vijayakumar is bullish on the stock. "One can realistically expect 35% rise in the stock in the next 24 months. With the economy recovering and credit growth picking up, there is no reason why the bank cannot get back to 30% quarter-on-quarter profit growth." The company has been improving its performance since July 2010. This has taken the return on equity, or RoE, to 25%. "The stock has given good returns in the past four years due to strong growth and high RoE," says Sarabjit Kour Nangra, vice president, research, Angel Broking. 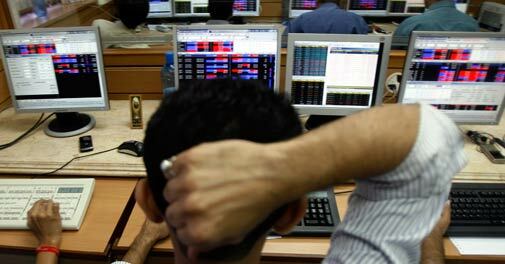 The stock rose 203% from Rs 286 on 1 July 2010 to Rs 868.45 on 1 July 2014. In 2013-14, of the overall anti-malarial drugs business of over Rs 430 crore under the UN's AMFm (Affordable Medicines Facility-malaria) programme, IPCA accounted for more than Rs 170 crore. The proposed expansion of the programme will offer a lot more opportunities for the company. The strength in the domestic formulation business, where half the market is accounted for by the chronic segment, has helped the company grow faster than the industry average. However, as exports are now a higher portion of sales, exchange rate fluctuations may impact profits. The company posted a net profit of Rs 4,777 crore in the year ended March, up 44% from Rs 331.39 crore in the previous financial year. Nangra of Angel Broking says, "We expect the company to expand net profit and revenue by 20% a year for the next three years. 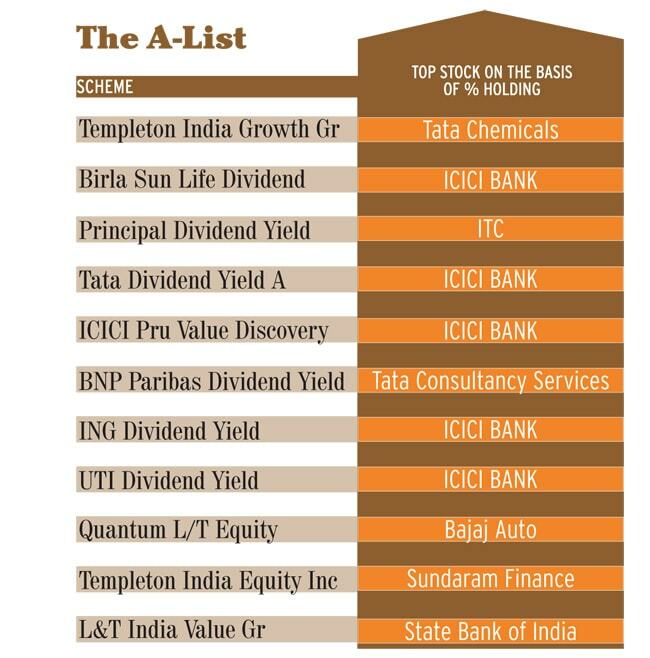 The stock can give at least 15% annualised returns in the next 24 months." Gruh, a housing finance company, is an HDFC subsidiary. Its main focus is lending to the selfemployed, who usually don't have formal income proofs. It has been a pioneer in financing India's non-urban housing landscape in Gujarat and Maharashtra (76% of portfolio). Silky Jain, research analyst, Nirmal Bang Securities, says, "The stellar performance on all parameters, be it loan growth, profitability, asset quality, return ratios and rewarding shareholders with dividends, is why Gruh Finance has given huge returns." The company recently ventured into the loan against property segment. Jain of Nirmal Bang is positive on the stock. "We believe that despite trading at high multiples, it will continue to remain an outperformer considering the company's steady record. We expect the stock to generate 15-20% returns every year, just like its parent HDFC." Kolkata-based Emami, founded in 1974, is present in many counties. It manufactures health and beauty products. The company is trying to enter niche segments and target rural and semi-urban markets, which are its main growth drivers. Some of its major brands such as Boroplus, Fair & Handsome and Navratna are leaders in their segments. Emami's strengths are customer loyalty, capable management and presence in several niche and fast-growing segments. 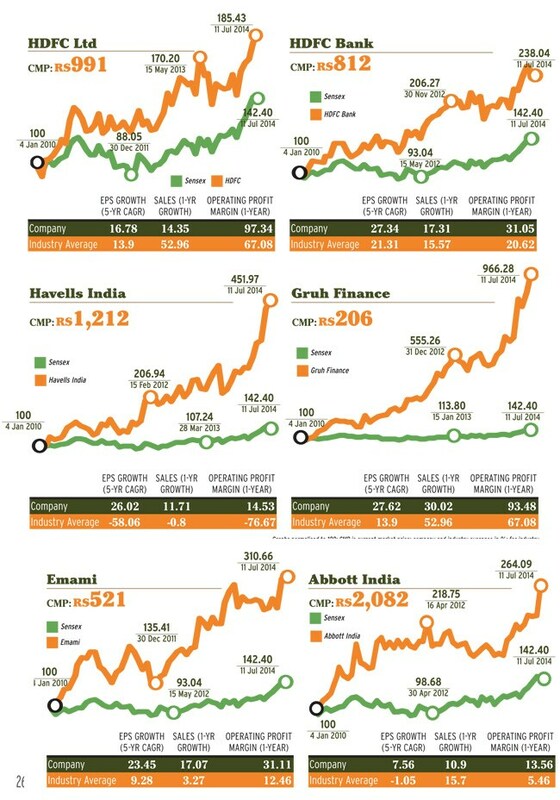 The stock has risen 95% to Rs 510 in the four years till July 1. Aditya Bapat, research analyst, institutional desk, GEPL Capital, says the reasons are healthy margin growth and acquisition of Zandu in 2008. The company is planning to launch new products in the male grooming segment as part of a plan to become a billion-dollar company. In June, it forayed into the women hygiene space by acquiring sanitary napkin brand 'She Comfort'. 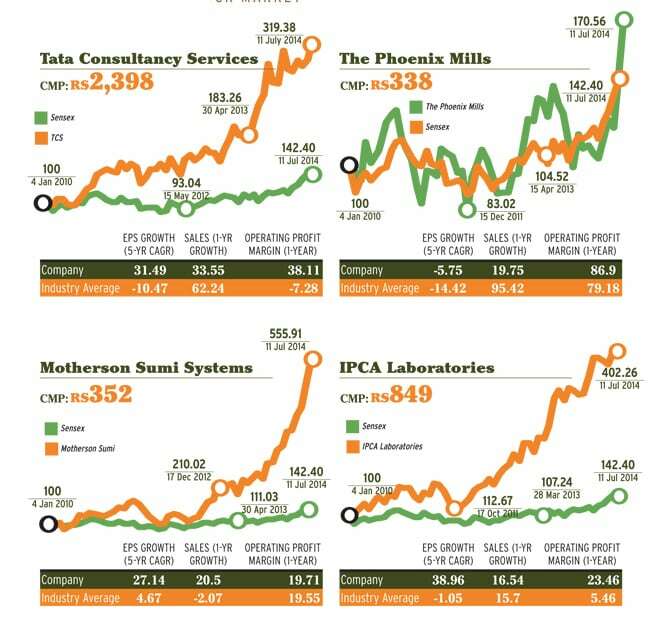 On July 4, the stock was trading at Rs 543, a PE ratio of 30.97 as against the industry average of 36.09. "The stock can touch Rs 667 in the next few quarters," says Bapat. Abbott is one the biggest pharma MNCs in India. The net profit of this debt-free company rose 21.14% to Rs 38.40 crore in the quarter ended March 2014 as against Rs 31.70 crore in the corresponding quarter a year ago. Net sales rose 17.72% to Rs 478.55 crore during the period. For the full year, net profit rose 37.15% to Rs 198.45 crore as against Rs 144.70 crore during the year ended December 2012. The stock has risen 95.84% in the four years to July 1. "In the pharma pack, MNCs have always done well, predominantly due to corporate action and mergers and acquisitions. By and large, we expect pharma, as a sector, to continue performing over the next few years as well. We expect over 20% return from Abbott India over the next two years," says Sudip Bandyopadhyay, president, Destimoney Securities. The performance of the company has improved significantly over the last few years both in terms of revenue and profitability. This has come at a time when most real estate companies have performed quite poorly. The company has lined up several retail, residential and office projects in many cities. Around three million square feet (msf) mall space is expected to become operational in Tier-2/3 cities over the next 18 months. A luxury residential project launched in Pune recently has got a good response. DK Aggarwal, chairman and managing director, SMC Investments and Advisors, says, "The company's strength is its diversified business model. It has operations in different segments, including hospitality, retail mall and commercial, and that too across geographies. Also, it is operating cash-flow positive due to lease income." It has been paying dividends regularly. It had cash and cash equivalents of Rs 140.30 crore at the end of 2013-14. However, the company has huge debt, as a result of which the interest outgo is high. Total debt was Rs 3,084 crore at the end of 2013-14. Housing Development Finance Corporation (HDFC): HDFC has been delivering net profit growth of 20% a year for the past four years, which has led to a fast expansion of book value per share (from Rs 92 in 2008-09 to Rs 180 in 2013-14). The stock has returned over 100% since July 2009. On July 7 this year, it was trading at Rs 1,017.50. Dilip Bhat, joint managing director, and Pritesh Bumb, research analyst, banking, Prabhudas Lilladher, say, "The market gives a lot of premium to any business which has reasonable growth, visibility and stability. This was more pronounced in the last four years. We expect HDFC to register annualised net profit and revenue growth of 17% and 18%, respectively, in the next three years." The company has started focusing more on Tier-III and Tier-IV cities for growth. Tier-I cities have been the drivers of loan growth till now. Experts say HDFC's strengths are its prudent management and high standards of integrity and transparency. This is coupled with a strong business model and franchise which is difficult to replicate, stable asset quality and high return ratios. Bhat and Bumb of Prabhudas Lilladher say, "As the economy revives, we expect the core mortgage business to lead growth. Also, a lot of clarity is expected on increase in foreign direct investment limit in insurance, where HDFC will be able to unlock value and reduce capital commitment. We expect an annual return of 18-20% in the next 24 months." Havells is an electrical and power distribution equipment manufacturer. The stock has risen 275% in the four years to Rs 1,171.25. Amol Rao, analyst (industrials), Anand Rathi Institutional Research, says, "The stock has been performing well because of steady revenue growth, strong operating profitability, healthy return ratios and decent cash flow." Expansion of the dealer network in Tier-II and Tier-III cities and launch of new products in these markets are noteworthy developments. Rao says, "Havells could see revenue and operating profit growth of 17-20% over the next two years in India operations."